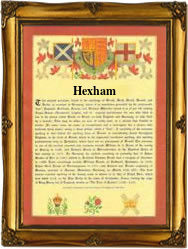 Recorded in several spellings including Hexham, Hexam and Hexum, this is an English locational surname. It originates from the town of Hexham in the county of Northumberland, and is one of the most ancient of all known places in the British Isles. The first known surviving recording is in the spelling of "Hagustaldesham", meaning the house belonging to Hagustald. This is in the famous Anglo-Saxon Chronicles of the year 681 a.d. whilst the town is also recorded by the earliest English historian, the Venerable Bede of Jarrow writing in about the same period although he spelt it as "Hagustaldensis ecclesia". The place name is not however Old English but Old British, predating the arrival of the Romans in the year 54 a.d. The surname is not however anything like the age of the town. Surnames were not generally introduced into England and Scotland until about the year 1300, but thereafter they spread rapidly and by the time of the reign of King Henry V111 (!510 - 1547) everybody had one which would be recognizeable today. In this case examples of recordings from the church registers of Northumberland include Ann Hexum of Berwick on Tweed on May 23rd 1593, Alix Hexsome who married Peter Gosling at the same place on February 28th 1602, and Isabella Hexham who was christened at Wallsend near Newcastle, on October 5th 1809.